The Milan was designed as a top of the range scooter which can be used on the main roads in style and comfort. As with all Shoprider class 3 scooters by the flick of a switch the speed can be charged from 4 miles per hour up to a maximum of 8 miles per hour. 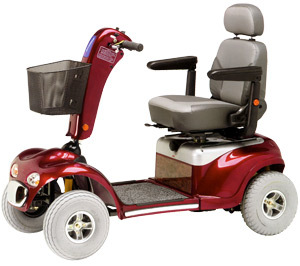 Its standard equipment includes a full light set consisting of head and tail lights, direction indicators and hazard flashers and a warning horn. A parking brake which can be used in emergencies is also provied. With independent all round suspension and four large 13" pneumatic tyred wheels the Milan offers the user a degree of comfort which is difficult to match. When you add the fully adjustable Captain Seat with cushioned armrests to the superb ride quality provided by the suspension system you really have one of the most comfortable scooters available today. The Milan just eats up the miles and with a superb range, journeys of considerabe distance can be undertaken with confidence. When fitted with a weather canopy the Milan is suitable for use all year round.